Hebrews 10:24-25 tells Christians to not neglect gathering together, but to seek all the more how we can stir each other up to love and good works. I just taught that passage last Sunday (audio of that message here), and in my preparation I discovered that the phrase “stir up” essentially means to pester or annoy someone, to not leave them alone. I’m thankful for people who do that in my life. A friend of mine had been politely pestering me to read James K.A. Smith’s “Desiring the Kingdom” for about a year before I finally picked up a copy and started reading it earlier this month. I’m glad I did. Liturgies, as he uses the term, are not confined or restricted to the order of service in a church worship service. 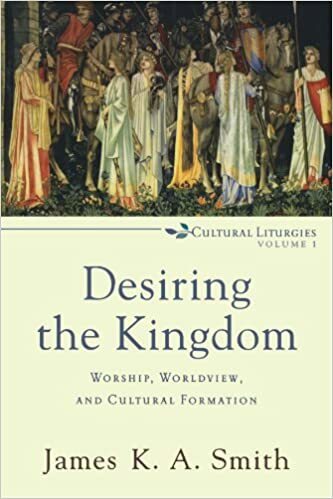 Liturgies are, according to Smith’s use of the word, “rituals of ultimate concern that are formative of our identity—they both reflect what matters to us and shape what matters to us.” Liturgies, wherever they may be found, serve to shape us by forming affections within us. Smith points out that such liturgies can be found throughout our culture, in places like malls, stadiums and universities, to name a few. As Christians, it is important that we intentionally submit ourselves to the kinds of liturgies which will shape us into the kind of people we believe we ought to become, and which shape our affections in the right direction. He points out that our nature as humans is such that we are not so much shaped by our worldviews as our worldviews are shaped by our practices, experiences and affections. Therefore, knowing this, it is important that we submit ourselves continually to the right kinds of “liturgies”. It is important therefore, that we recognize the “religious” nature of cultural practices and institutions, and understand that they are not neutral and that participation in them shapes us in very real ways. We should be aware of this fact, and also decide what “liturgies” we want to participate in, in order to shape our affections in the right directions. Statistics show that church attendance has a radical impact on families and on the success and health of marriages.